22 × 27 cm, 142 illustrations. Hardcover. 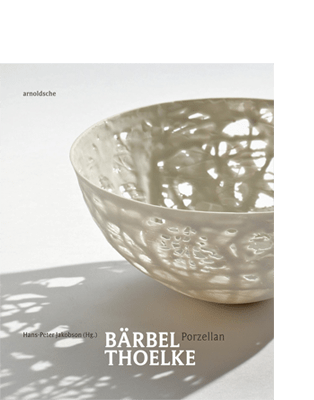 The life’s work of the Berlin-born porcelain designer Bärbel Thoelke unites the strictest design discipline with creative imaginings to make a superb, coherent and, in her own way, unique oeuvre in contemporary German studio porcelain. It is characterised by a consistent concentration on the vessel and encompasses not only studio series but also one-off vessels. At the same time, she works with such traditional manufacturers as KPM, the State Porcelain Manufactory Meissen, the Schwarzburger Werkstätten für Porzellankunst and the Viennese porcelain manufacturer Augarten. Her mantra: ‘to realise my very personal ideas of an object which one would like to live with every day and which is perhaps only troubling when it is not there’. HANS-PETER JAKOBSON was born 1947 in Wittenberge (Prignitz, DE). Jacobson studied cultural sciences and the history of art at Humboldt University in Berlin (DE). Director of the Museum of Applied Art in Gera (retd), freelance curator and publicist. Lives in Gera (DE) and Quitzöbel (Prignitz).